Do you have that one meal that you cling to when you have company? The one you know will be a crowd pleaser, the one your friends beg you to make? For me, it’s always been eggplant parmesan. I could make this dish in my sleep. The famed Julia Child always says to never make a new dish for company…. Let me tell you I’ve made this mistake far too many times. When you’re having guests, stick to things you know like the back of your hand. Your overall anxiety levels will be far lower and you’ll reduce the chances of giving your guests food poisoning. 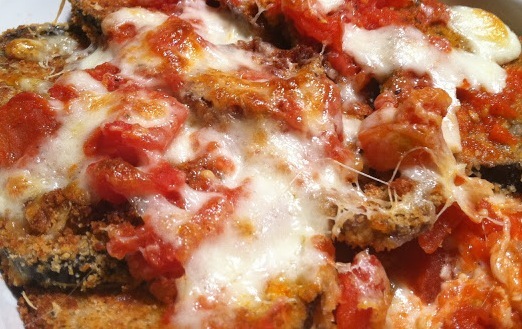 What’s better than layers of pan-fried eggplant, gooey mozzarella, salty parmesan and home-made tomato sauce? Probably nothing. I adore eggplant. I think I like eggplant almost as much as avocado, which is a lot. You all know how I feel about food that starts out as a blank canvas. Eggplant most certainly checks that box. It will take on the flavor of just about anything you pair it with, it can be cooked a variety of different ways and it will taste completely different depending on preparation. I’s also healthy– added bonus. This dish is a great one to bring to work next day…it won’t taste like unrecognizable slop when you re-heat it (don’t you hate that!?) and it’s also awesome if you put it between two slices of focaccia and throw it on the Panini press. I’m giving away a huge secret with my homemade sauce recipe. You can be lazy though and buy the store bought kind . I won’t judge you…but mine is better. Slice the eggplant into 1/4 inch round slices. Sprinkle both sides with a little bit of salt and let sit out at room tempature on paper towels for 30 minutes. This step is a must! It will allow the bitterness to come out of the eggplant. While the eggplant is sitting out, start your sauce. In a dutch oven or large sauté pan, add olive oil and cook onion and red pepper flakes on medium-high heat for 3 minutes. Add garlic and cook another 2 minutes. Add in whole tomatoes and crush them with the back of a wooden spoon. Add in crushed tomatoes, salt and pepper and cook for 10 minutes. Turn heat down to medium low and add in a splash of red wine, stir to combine and cook another 10 minutes. Add in the basil and set on low heat for 5 minutes. This step is optional, but I like how the consistency comes out. Take half of your sauce and put it in a food processor or blender and pulse it a few times. Add it back to the sauce and keep on low until you are ready to assemble the eggplant. Back to the eggplant. With a damp paper towel, wipe both sides of the eggplant. You wil notice some liquid has come of the eggplant slices–this is the bitter stuff I was talking about. You don’t want that. Put your flour on a large plate and the beaten egg in a bowl and breadcrumbs in another bowl. Dredge each eggplant slice, on both sides, in this order: Flour, egg, breadcrumbs. Working in batches, you are going to fry your eggplant in a sauté pan on medium-high heat, about 2 minutes per side. As you go along, you will notice your olive oil might start to burn. If that happens, just wipe it out with a paper towel and add a little more. I usually get about 5 slices in per fry batch. I drain excess grease on paper towels until I finish all the eggplant. In a 9×13 greased baking dish add a layer of sauce, then eggplant, sauce, parmesan then mozzarella. Repeat until you reach the top of the baking dish. Cover with aluminum foil and bake 15 minutes. Remove aluminum foil and bake another 15 minutes or until sauce is bubbly and cheese is completely melted. Served with pasta and sauce!